On first glance, “Christmas in Homestead” seems like a rehash of movies we’ve seen before, but strong acting make this one totally worth it and heartfelt. A famous movie star, Jessica, is producing a new Christmas movie in the small town of Homestead, Iowa. Homestead is the perfect small-town of these movies with local gatherings, beautiful and elaborate Christmas traditions, and a hot b&b owner who has the cutest little girl known to man. Oh, and he’s also the town’s mayor. There is a subplot concerning the town’s festivities potentially being ruined by the filming, but this one is really all about the romance. I was not particularly excited about this one because I don’t really like the “fancy Hollywood-type” becoming a fish-out-of-water in a small-town, and “aw, shucks!” she really likes it there, eventually. The reason I usually don’t like these stories is because they make the small-town folks seem more like caricatures than real people and insinuate that everyone would be better off if they just slowed down and took it easy. What this movie does right is show that small-town people are normal people who live regular lives that have the same ups and downs as everyone else. Is the setting pretty? Sure, but there is a realness as well. My favorite thing about this movie has to be the secondary characters. From the paparazzo to the bodyguard, the quirky sister, the ex-boyfriend, and the prototypical little girl, all the secondary characters shone with depth that is not normal in movies such as this. The little girl, Brooklyn Rae Silzer, is the hands-down, best kid actor that I’ve ever seen in a TV movie. My other fave is Michael Rady as Matt; his inauspicious, regular-guy routine won me over in spades, and I hope to see in many more Hallmark movies. And Taylor Cole… it isn’t fair how beautiful she is. She was perfectly believable in this role. Since this town has lots of Christmas traditions, there was plenty of Christmas spirit to go around, although the story didn’t “need” the backdrop of Christmas to advance the plot. We have a snowman-building contest, town-lighting, and decorations galore. I’ve lost count. Is this the 10th movie? 11th? While I enjoyed this one, the movies are piling up like a big ball that is chasing me, gathering dirt as is goes. More to come, assuming I’m not squashed by the ball first. “The Mistletoe Promise” is Hallmark’s second entry this year into the Countdown to Christmas movie promotion. With a typical name and typical selections of actors for the leads, you would expect this movie to follow the pack, but you would be wrong. “The Mistletoe Promise” breaks the mold by being a movie about adults, for adults. The Christmas magic is not sprinkled on, but comes out of the goodness of people. A divorced owner of a travel agency, Elise, has a hard time with Christmas because it is during that season in which her jerk ex-husband and co-owner of the agency tries to bully her in to selling the business to him. Even though she built it before she even met him. Nick has just been tapped to compete for partner in his law firm, but the firm is very family-friendly, and a girlfriend or wife seems to be a “must”. When he encounters Elise in a food-court, they share their disdain for Christmas and offer to help each other make it through the season. This “promise” morphs into a contract in which they will pretend to be dating to help keep her ex-husband at bay, and help him make partner. Like I said before, this movie is about adults and adult situations. Therefore, it feels more real than Hallmark’s usual fare. Santa isn’t coming along to make silly things happen to Elise’s mean ex-husband. Ok, I know she started as a model, but can I just say that Jaime King is beyond gorgeous? And girl can really act. I felt every bit of Elise’s pain and rejection, her insecurities (even though she is a goddess) and her desire to overcome. Perfection. Luke MacFarlane is hot, very believable as the hardworking lawyer who has been hurt and has pushed past the pain with work. See what I mean about the adult stuff? Yes, people actually DO work in real life and don’t just sit around making Christmas cookies with their moms and visiting old inns. I’m not disparaging those movies; they are a great escape and part of the reason I began my quest to watch all the Hallmark movies, but it is refreshing to watch a movie about real people finding Christmas spirit in themselves and just trying to be good people. The premise of them both hating the Christmas season is there, as well as a snowman-building contest and some Christmas parties. Oh, and carolers. Let’s talk about the carolers for a second: who would go up to someone and start singing, and when they look super uncomfortable, continue singing and get closer? If you do this, you would be the worst caroler in the world. I felt secondary discomfort for the main characters who were forced to endure this caroling torture. But, the Christmas spirit is very much present in this movie, and is perhaps even more palpable because it suggests that we, no matter how busy we are, what background we come from, if we have kids or not, can share goodness with the world. Way to go, Hallmark, on this thoughtful, well-acted Christmas movie! It is based on a book by Richard Paul Evans, which probably helped the story, but the execution was very good and it is another top-notch entry into their line-up of Christmas movies. 5 stars! Two movies down! 17 to go… How are you keeping up with the challenge? 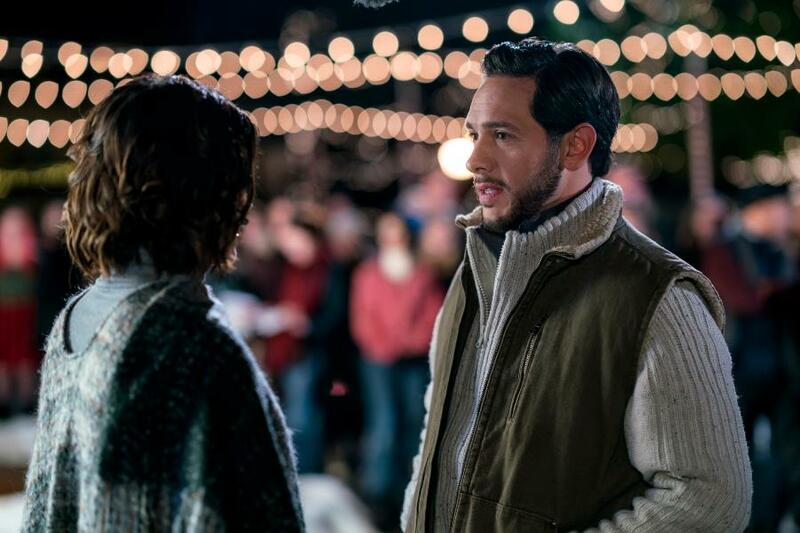 “A Wish For Christmas” is the first Hallmark Christmas movie of the season! So, last year I got hooked on Hallmark Christmas movies. I watched most of them, including the ones from past years. There was something comforting and happy about seeing a couple come together in that magical setting which usually involves snow, hot chocolate, and snuggly scarves. 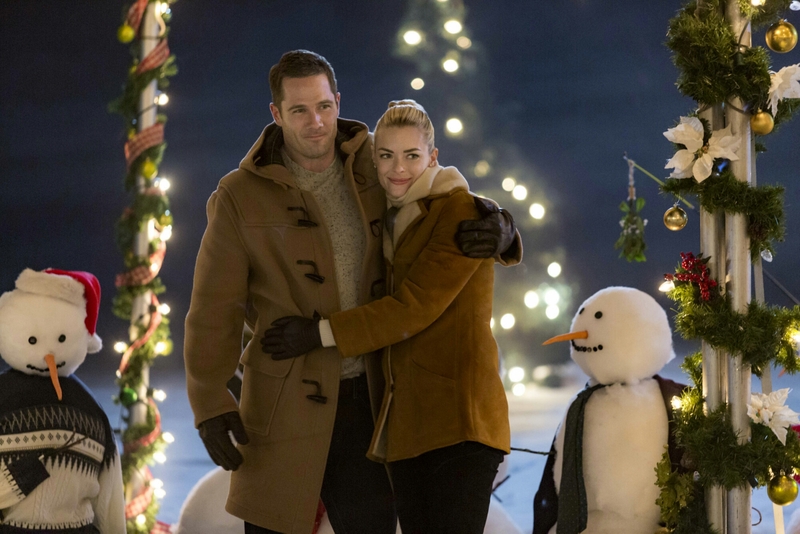 When I started this blog a few months ago, I had the idea to include Hallmark movies in my reviews and was especially looking forward to this Christmas season. You see, I intend not only to watch all the new Hallmark Christmas movies this year… I plan to review them on this blog. With like 20 movies coming at me like snowballs, I figured I’d better get started. So here goes! Hallmark movie fave and staple, Lacey Chabert, is back as Sara: a shy girl who tends to allow people to treat her as a doormat. After her jerk boss steals her idea, she makes a wish at a Christmas party to the “fake” Santa to be brave and to stand up for herself. You go girl! The wish is granted, and she takes the opportunity to let previously mentioned jerk boss know how unfair it was for him to treat her in that way. Hot big boss overhears, and offers to let her pitch the idea with him in Seattle to the client. Lacey Chabert is totally reliable and perfect in these roles. Although this wasn’t my favorite Chabert Hallmark movie (I would have a hard time choosing between All of My Heart and Matchmaker Santa), I thought she did a great job of showing the transition of someone who is learning to stand up for themselves. Okay, that being said- can we talk about Paul Greene for a minute?!? To me, he is just the perfect sensitive, yet still manly, guy. I fell for him back in “Anything for Love” with Erika Christensen as a male nurse whose best friend pretended he was a doctor on match.com (DVR that one people, it is so good.) He did not disappoint here; he just totally represents that good guy we all want. The story was a nice play on some familiar territory: I am a sucker for wishes that you get to see play out. The end was a little bit rushed and not completely as fleshed out as I would have liked. We got Santa, a wish, Christmas cookies, tree shopping, a Christmas party, and some nice scarves and hats. The Santa stuff was well done (better than most), but some of the rest felt a little shoehorned in. Did this story HAVE to happen at Christmas? Well, the wish did, but the business stuff didn’t. But, the wish gave her the confidence to do the rest, so it works. I am sure I will see Christmas movies this year that are a bigger stretch for the holiday. PS- If you would like to join me in my Hallmark Christmas movie challenge, I would love to hear your thoughts and keep track of the movies we watch. Please comment below! The first cassette tape that I owned was “Out of the Blue” by Debbie Gibson, and my “electric youth”-scented childhood was played out with her music as the soundtrack. So, when I saw that the newest Hallmark movie, “Summer of Dreams”, featured my childhood idol, I couldn’t wait to see this fusion that must have been created with me in mind. The Story– Debbie Gibson plays “fictional” Debbie Taylor who happened to burst onto the pop scene when she was 15 with the hit single “Only in my Dreams” and has been making music ever since. (This role must have been a huge stretch… ) Debbie has been dropped by her label, pushed aside by her sort-of boyfriend, and sang her last concert in a mattress store. She needs a change of scenery, so she heads to her sister’s cozy, ideal house and life to regroup. My Thoughts– Although the story was a bit trite like most Hallmark Movies, the acting was pretty good, especially from Ms. Gibson and the actress who plays her sister, Pascale Hutton. Would I have preferred to watch Debbie Gibson sing her back catalogue for an hour and a half instead? Yes, but as far as Hallmark Movies go, this wasn’t a bad one. It was certainly better than Mariah Carey’s movie from last year where she just made me feel uncomfortable every time she was on screen. (Come to think of it, she was the soundtrack of my teens.) The love story, while not entirely captivating, was chill and believable, and most of the kids in her Glee-style choir were watchable. But, when Debbie Gibson sings, you just wish it wouldn’t stop. She obviously has loads of talent and stage presence. Season Satisfaction– While advertised as a summer movie, the kids are in school and there is nothing mentioned that is summer-related. But, Debbie Gibson does seem like a summery person, so I guess it works…? Seriously, I read that she came to Hallmark with this idea and they fast-tracked it, so I imagine they called it whatever they needed to air it ASAP. The Bottom Line– If you like Debbie Gibson, Glee, or teacher movies, you will enjoy this like a nice mint julep on a summer’s day. It goes down easy and puts a smile on your face.